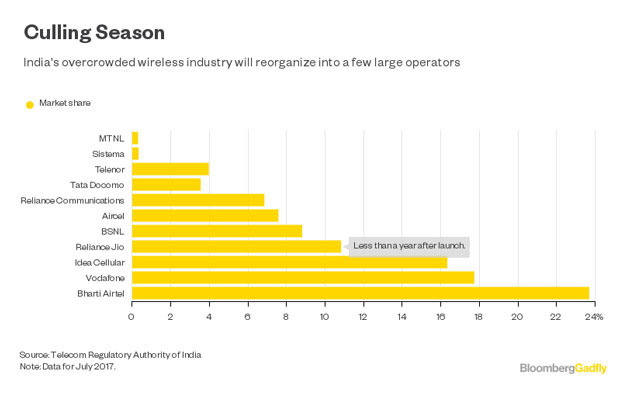 The telecom landscape of India is changing exponentially. Approximately 215 million subscribers may have to change their allegiances due to the lack of financial stability at Reliance Communications, Aircell and Tata Teleservices (which is on the verge of closing down its operations across India). The beneficiary is Mukesh Ambani. The oil tycoon who ties with Tencent Holdings Ltd.'s Pony Ma as the third-richest person in Asia is winning subscribers at a rate of 5 million a month by offering free voice calls and cheap data through his operator Reliance Jio. 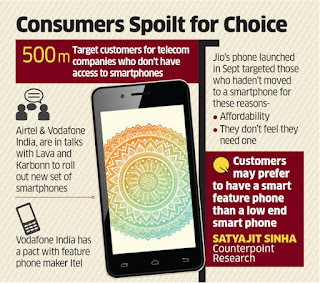 In effect, apart from giving telecom companies a run for their money, Reliance Jio is also set to disrupt India’s smartphone market. Launched last September, Reliance Jio already offers free voice calling, as well as the world’s cheapest internet data plan, starting at Rs49 ($0.76) per gigabyte (GB). On the JioPhone, voice calling will “always” be free and unlimited data will cost only Rs153 ($2.38) per month. Its free schemes and recharge options have expanded Jio’s user base rapidly. Some 66% of Reliance Jio customers were using the service as their primary connection by March, up from 50% in December. The company claims that mobile data usage in India fared around 0.2 billion GB per month in the pre-Jio era. After Reliance Jio’s entry, overall data consumption supposedly skyrocketed to 1.2 billion GB per month, of which 1 billion is consumed by Jio subscribers. According to Ambani the service provider now has over 125 million customers. However such radical changes are accompanied by various issues for example with only 300 million smartphone users in the country, the growth could soon hit a wall—hence, the development of the JioPhone, a 4G-enabled feature phone with a large screen and access to apps. More on the JioPhone here. 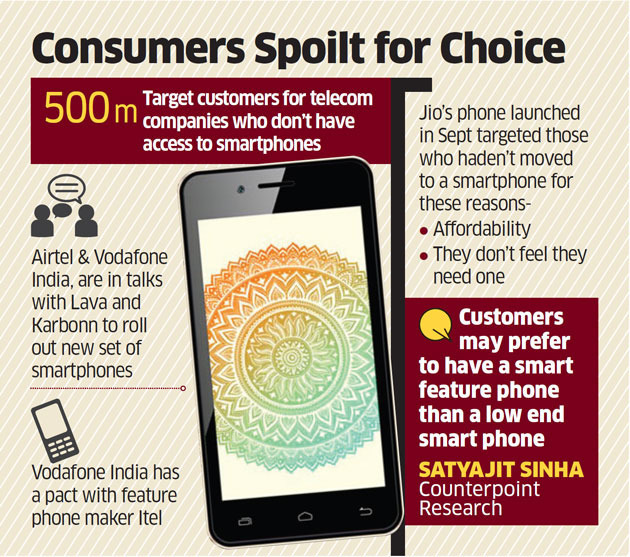 Not to be left behind Airtel and Vodafone India are also launching smartphones. So Jio are dynamic enough to offer competitive data rates and a 4G phone but as a result the prices of wireless data have fallen by about 97% in one year after the entry of Reliance Jio, from about Rs 200 per GB a year ago to about Rs 6 per GB in the June quarter. While operators like Bharti Airtel and Idea Cellular used to offer 1 GB of data for Rs 250, they now offer about 50 GB for the same price. Such massive growth creates its own problems for example: Reliance Jio’s network is “overloaded”, with congestion creating a bottleneck that is slowing down connections for its customers, according to new analysis by OpenSignal. According to this report, Reliance Jio lags behind Airtel, Vodafone, and Idea in terms of 4G speeds, but is market leading in terms of 4G coverage. Moreoever what about the ARPU downshift? According to analysts due this reorganisation of subscribers and the very reasonable prices they are paying this is will continue. Reliance Jio has irreversibly changed the market from a pricing-focused one to an ARPU-focused one. In the price-focused market, companies like Vodafone and Airtel tried to keep prices high, volumes low and margins fat. In the volume-based game, pricing is dictated by two factors — the ability of the network to support demand, and the need to increase consumption by users. While the second factor — the need to increase data use — puts a downward pressure on prices, the first factor — network stability and quality concerns — puts a bottom on how low they can be kept. Another major issue is spectrum India allows relatively little spectrum for mobile communications, and splits that up among a dozen operators. A lot of radio spectrum is blocked for defence use. The 'Spectrum Crunch' is pretty bad, for example Delhi's top operator has roughly the same number of 3G users as its counterparts in Singapore and Shanghai (about 3 million), but it has about a tenth of their spectrum. As user numbers grow - faster than spectrum availability. And more people will use data, especially video, stressing the network further. This is yet another challenge for the operators. Success in this new telecom landscape depends almost entirely on network capacity. The more capacity the network has, the lower your offering can be priced and the higher consumption can be driven.